I carved out a bit of stamping today. This card worked out so well, I got 3 challenges together! I combined Less is More’s Tropical Fruit challenge with CAS(e) This Sketch and kept it all One-Layer for Addicted to CAS. I think my thought process is pretty obvious once you see all the challenges. I did choose the swoosh and sentiment because their style seemed to compliment the artsy rendering of the pineapple. I am quite surprised at how quickly this one came together and I’m so happy with it. 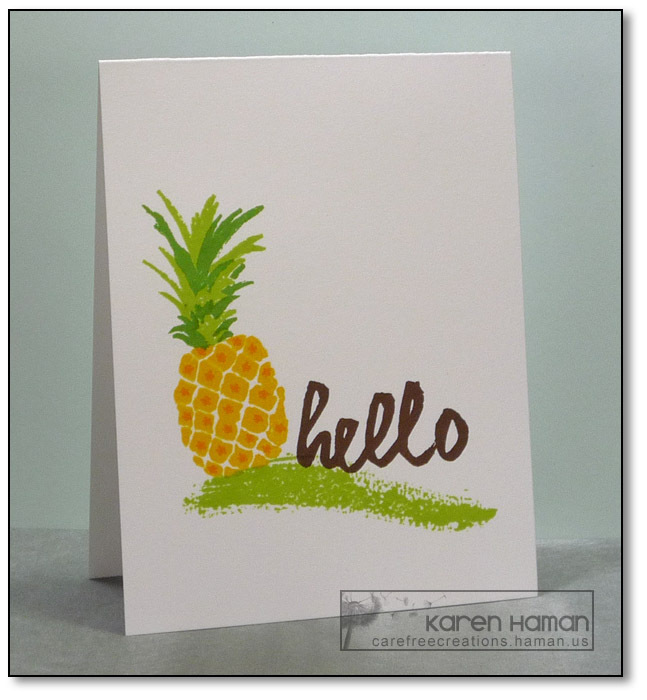 Beautiful design, gorgeous stamping and a wonderful CAS card. Thanks for playing at Less is More with us. I agree…this card is pretty much perfect for all three challenges! Totally love it! Thanks for playing along with us at Addicted To CAS. What a fabulous CAS creation! Your stamping is flawless and I love the combination of images and colors. Great job! Thanks for joining us at Less Is More!